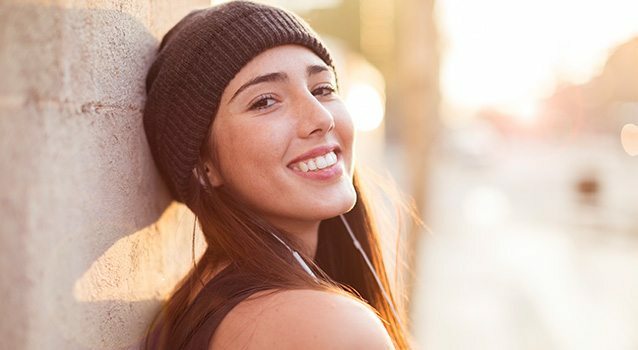 Dental implants provide a natural looking and durable solution to replace a lost tooth or teeth, due to injury or disease. Dramatically improve your health, quality of life, and self-esteem by permanently replacing missing teeth using dental implants. Implant dentistry is one of the most successful options available for replacing missing teeth. The implant itself is a small, titanium post, which is surgically placed in your jawbone. 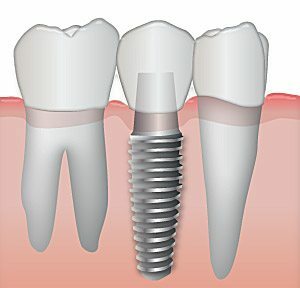 After a time, the implant fuses with the bone and is supported by the gum tissue, much the same way that the natural tooth root would provide stability and strength to a tooth. Then a replacement dental crown, bridge or denture is attached to the metal post, providing a permanent solution that looks and works like your natural teeth. High Success Rate – Decades of research have shown that with proper dental hygiene, dental implants have a success rate around 95%..
Strong As Natural Teeth – Because the dental implant is anchored in the bone, it will offer the same biting force as a natural tooth. Smile, speak and eat with ease. Long Lasting Solution – Unlike dentures and bridges, which may need to be replaced up to 3 times, dental implants can last a lifetime (with proper dental hygiene). Saves Adjacent Healthy Teeth – Neighboring teeth aren’t harmed or affected since they are not used for support, as they would be for a dental bridge. Easy to Maintain – Dental implants are cared for as if they are natural teeth—brushing, flossing, and regular dental visits. If dentures or bridges are anchored by implants, they can be easily removed for cleaning, and then easily and securely replaced. Dr. Michael Wong can determine if you are a good candidate for dental implants. First the dental implant is attached to the jawbone by an oral surgeon. A few months later, after the implant has fused with the bone, a replacement tooth or crown will be placed on top of the implant by Dr. Wong. A fixed bridge or removable denture can also be anchored by a dental implant to provide comfort and stability.